100% derived from renewable resources (biopolymers, wood flour and additives of vegetable origin), the references of the BioFibra® range are biosourced and compostable. 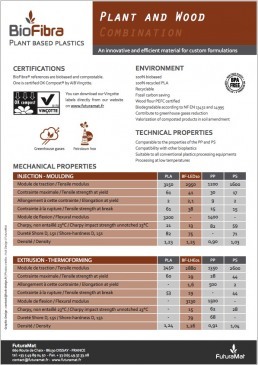 The reference BF-LHE01 is labeled OK Compost®. 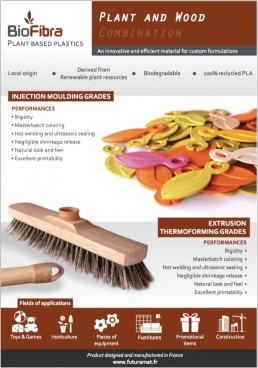 BioFibra® materials are ideal for processing techniques such as injection, extrusion or thermoforming, and are suitable for applications in horticulture, packaging and, more generally, for disposable technical parts. The woods used (beech and spruce) are all of from European origin and are certified by the PEFC* program.